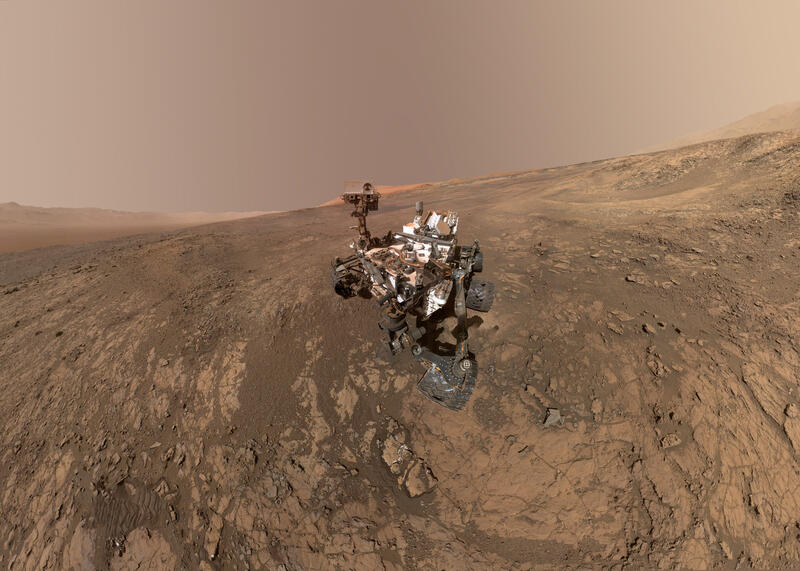 These organic compounds, a requirement for life as it's known on Earth, were found in 3-billion-year-old rocks deposited on the floor of Gale Crater. While organics were discovered by the rover earlier, the age and variety of the newly analyzed samples strengthen the case for a habitable environment in the past. "We found organic molecules in rocks from an ancient lakebed," said Jen Eigenbrode, a research scientist and astrobiologist at NASA's Goddard Space Flight Center in Greenbelt, Md. "Those organic molecules could have come from life." "Today, we're announcing the discovery of a repeatable, identifiable, seasonal pattern in the methane measurements," said Chris Webster, a senior research fellow at the Jet Propulsion Laboratory in Pasadena, Calif.
"Not only have we got this wonderful repeatability, but the seasonal cycle changes by a factor of three. That's a huge change, completely unexpected. And what it does, it gives us a key to unlocking the mysteries associated with Mars methane because now we have something to test our models and our understanding against." A seasonal change in methane levels is exciting, he said, because 95 percent of the methane observed on Earth is the result of biology. In addition, methane only lasts a few centuries before it is broken down or escapes the atmosphere "so if we see methane in the martian atmosphere, that means something is happening today, it's being released or it's being created." Methane in the martian atmosphere has been detected before, but only in isolated patches or plumes of higher concentrations, not in any repeatable pattern. Rising levels in the summer months, when Mars is warmer, could be an indication of on-going biology or it could simply be the result of purely geological processes. "The idea that best fits our data is the idea of sub-surface storage," he said. "So way under the ground this methane is trapped. ... We don't know if that methane is ancient, we don't know if it's modern. It could be either. We also don't know if that methane was created from rock chemistry or it was created by microbes." But NASA managers say the new discoveries show the agency's Mars exploration plans are on the right track. NASA currently operates three orbiters and two surface rovers at Mars with a new lander -- InSight -- on the way. The European Space Agency plans to launch its own rover in a few years and NASA is building a powerful follow-on to Curiosity, the Mars 2020 rover, that will be equipped with even more powerful instruments to advance the search for life. "With these new findings, Mars is telling us to stay the course and keep searching for evidence of life," Thomas Zurbuchen, NASA science director at agency headquarters, said in a statement. "I'm confident that our ongoing and planned missions will unlock even more breathtaking discoveries."